ATLANTA (AP) — Third time's a charm. At least that's what frustrated voters in one Georgia House district are hoping after two previous elections were thrown out by a judge. NASHVILLE, Tenn. (AP) — A Tennessee legislative panel has spiked a bill allowing candidates to use their campaign funds to pay for child care. JACKSON, Miss. (AP) — Two people have won special elections to the Mississippi House. A third election is headed to a runoff. JACKSON, Miss. (AP) — Residents in three Mississippi House districts are voting Tuesday in nonpartisan special elections. HARRISBURG, Pa. (AP) — A Republican state lawmaker survived four rounds of voting Saturday to become the heavy favorite to fill an open congressional seat in northern Pennsylvania. AUGUSTA, Maine (AP) — Democrats have selected a candidate to run for a seat left vacant by a recently re-elected Democratic lawmaker who took a private sector job. OWENSBORO, Ky. (AP) — Recount in contested Kentucky state House election ends in tie. INDIANAPOLIS (AP) — Legislative Republicans have rejected a Democratic attempt to lift requirements that voters give a reason for seeking to cast a ballot by mail. CONCORD, N.H. (AP) — While much of the focus has been on young voters, New Hampshire lawmakers also are considering changes to make it easier for older residents to cast their ballots. FRANKFORT, Ky. (AP) — In a story Jan. 23 about a contested Kentucky House election, The Associated Press reported erroneously that Anna Whites represented DJ Johnson. She is the attorney for Jim Glenn. CONCORD, N.H. (AP) — New Hampshire Democrats who objected to what they viewed as voter suppression legislation are proposing new bills aimed at expanding voter turnout. The House Election Law Committee held public hearings Tuesday on two constitutional amendments: One would allow 17-year-olds to vote in primaries if they will turn 18 by the date of the general election; the other would make absentee ballots available to all voters, not just those who fit certain circumstances. HARTFORD, Conn. (AP) — A special four-member committee of the Connecticut House of Representatives has begun the process of reviewing a contested election. The two Democrats and two Republicans decided Friday to ask the candidates in the 120th Assembly District to provide them list of potential witnesses and related documentation by Tuesday. The Committee on Contested Elections hopes to hold a hearing with invited witnesses on Jan. 18. JACKSON, Miss. (AP) — Gov. Phil Bryant set March 12 special elections for Mississippi House seats that are vacant because three former lawmakers became judges. Former Rep. Willie Perkins of Greenwood is now a chancery judge. He represented House District 32 in Leflore County. Former Rep. Adrienne Wooten of Jackson is now a circuit judge. She represented House District 71 in Hinds County. RALEIGH, N.C. (AP) — North Carolina's governor followed through Friday on his plans to veto legislation that would require a complete election redo in a disputed U.S. House race should new balloting be deemed necessary due to fraud. Democratic Gov. Roy Cooper announced in recent days he would veto the measure because of other bill language that would make future state elections board investigations of apparent criminal campaign finance violations confidential. RICHMOND, Va. (AP) — Virginia voters made their picks Tuesday in several competitive congressional races, flipping Virginia's congressional delegation from a Republican to a Democratic majority. Voters also cast ballots in a special state House election that kept Republicans in control in the Virginia House of Delegates. RICHMOND, Va. (AP) — Virginia voters will make their picks Tuesday in several competitive congressional races that could help determine control of the U.S. House as well as a special state House election that will decide the balance of power in the Virginia House of Delegates. Voters will also cast ballots in a U.S. Senate contest between Democratic Sen. Tim Kaine and Republican challenger Corey Stewart. CHATTANOOGA, Tenn. (AP) — Marilyn Lloyd, who became the first Tennessee woman elected to a full term in Congress and went on to serve two decades, has died. She was 89. Lloyd's family said in a statement that the congresswoman died Wednesday. The Chattanooga Democrat represented Tennessee's 3rd Congressional District for 10 terms, from 1975 until she retired in 1995. She never lost a House election. Born in Fort Smith, Arkansas, in 1929, Lloyd entered politics in tragic circumstances. State Rep. Gabrielle LeDoux says it would be absurd to think there would be any manufacturing of votes in her House election. She says she's never done that, and worked hard to campaign door-to-door in her district, especially among the large Hmong population. COLUMBUS, Ohio (AP) — A special congressional election in Ohio will be the last test of voter sentiment nationally before November's high stakes midterm election — and the topic of President Donald Trump is never far away. Up for grabs on Aug. 7 are the last few months of former U.S. Rep. Pat Tiberi's unexpired term. The long-serving establishment Republican retired from the 12th Congressional District in January, creating a coveted open U.S. House seat. COLUMBUS, Ohio (AP) — Ohio voters can start casting ballots in next month's special election. Early voting for the Aug. 7 special election and 12th District general election begins Tuesday. Residents can vote absentee by mail or in person without having to give a reason. Republican Secretary of State Jon Husted (HYOO'-sted) says voters will decide four local issues across seven counties. RALEIGH, N.C. (AP) — New requirements on web-based political ads in North Carolina campaigns have narrowly cleared a legislative committee. The House Elections Committee voted 12-11 late Tuesday for a measure designed to address the rapidly increasing use of social media platforms to get out political messages. Weeks into the primary season, with five more states voting Tuesday, Democrats' midterm class is shaping up to test what liberal messages the party can sell to the moderate and GOP-leaning voters who will help determine control of the House after the November election. AUSTIN, Texas (AP) — Texas has a special election set for late June to replace Republican U.S. Rep. Blake Farenthold, who resigned last month amid allegations of sexual harassment and word that he used $84,000 from a special House fund to settle a 2014 lawsuit stemming from them. HARRISBURG, Pa. (AP) — Pennsylvania will fill the empty seat of resigned U.S. Rep. Patrick Meehan in a special election on Nov. 6, the day of the general election. Wednesday's announcement by Gov. Tom Wolf also will apply to the expected resignation of U.S. Rep. Charlie Dent. That would leave a special election winner just two months in office before a successor picked in the general election takes over for a full two-year term in Congress. Republicans have known for months that their House majority is in genuine peril. But after another bruising showing in a special election, some in the party are reconsidering the once inconceivable notion of losing the Senate. House already threatened, could GOP also lose Senate grip? JACKSON, Miss. (AP) — Gov. Phil Bryant is setting a special election to fill a vacant seat in the Mississippi House of Representatives. The July 10 election will be in District 77 in parts of Rankin and Simpson counties. If a runoff is needed, it will be held July 31. The seat became empty when Bryant appointed fellow Republican Rep. Andy Gipson of Braxton to serve as the state's commissioner of agriculture and commerce. Gipson had represented District 77 since 2008. JEFFERSON HILLS, Pa. (AP) — To help explain Tuesday's stunning special U.S. House election in southwestern Pennsylvania, look to Ed Karloski's political preferences for how Democrat Conor Lamb seized the lead for a seat in a Republican stronghold. Karloski, a steelworker and registered Democrat, voted for Republican Donald Trump as someone who appealed to his middle-class sensibilities, although he had no real love for a presidential candidate he saw as the "lesser of two evils." The midterm election year is off to an ugly start for President Trump. Democrat Conor Lamb's narrow victory Tuesday for a House seat in Pennsylvania still unofficial with absentee and other ballots yet to be counted came in a district that Mr. Trump won by 20 percentage points in 2016. 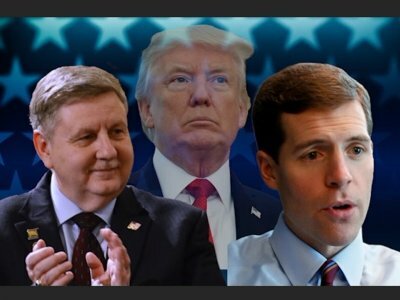 Mr. Trump campaigned there last weekend for Republican Rick Saccone. He predicted Mr. Saccone "should win easily, and he is going to win easily." WAYNESBURG, Pa. (AP) — Democrat Conor Lamb went to Pennsylvania's coal country for help in the final days before the first congressional election of 2018, telling union members Sunday that he won't forget their support in a close race widely viewed as a key test of support for Republicans ahead of November's midterms. GREENSBURG, Pa. (AP) — There is no sign of Republican congressional candidate Rick Saccone on Sherwood Drive. Days before a special U.S. House election in western Pennsylvania, Saccone's campaign told some residents that he might be knocking on doors that morning. It's almost 11 a.m. They're waiting. "He was supposed to stop by today," 68-year-old Republican John Debich says, scanning the empty streets of suburban Greensburg from his front porch. "It's the second time we've been avoided." CONCORD, N.H. (AP) — Presidential candidates won't have to share their tax returns if the New Hampshire House goes along with the recommendation of its Election Law Committee. The House is voting Tuesday on a bill that would require candidates for president and vice president to file three years' worth of federal tax returns with the secretary of state. The House Election Law Committee voted 17-3 to recommend killing the bill. JEFFERSON CITY, Mo. (AP) — Missouri lawmakers could change a law that sparked controversy over where the state's attorney general lives. TOPEKA, Kan. (AP) — Candidates would be required to be at least 18 to run for statewide offices in Kansas under legislation drafted in response to six teenagers entering the race for governor. The Kansas House Elections Committee is considering whether to set an age requirement for running for governor, secretary of state, attorney general, state treasurer and state commissioner of insurance. TOPEKA, Kan. (AP) — A proposed bill before the Kansas House would require lawmakers and some state officials to wait a year after leaving office before they could become lobbyists. The House Elections Committee discussed the bill on Monday but took no action. Current state law prohibits lawmakers and public officials from being lobbyists only while they are serving in state government. WASHINGTON (AP) — President Donald Trump is not so good at keeping score. In a tweet Monday, Trump knocked the media for refusing to say "Republicans are 5-0 in Congressional Races this year."